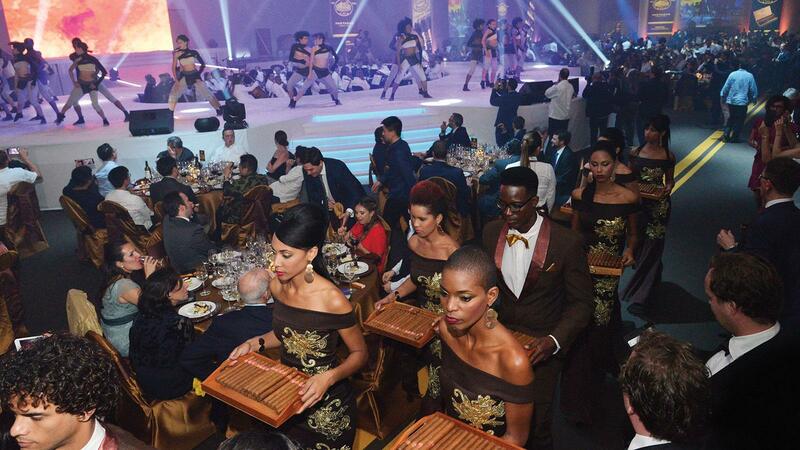 Cigars abounded at the gala dinner capping the 20th Habanos Festival. More than 2,000 were at the festival, and 1,200 attended the final evening. The line of taxis, old Russian Lada limos and vintage American-made convertibles inched down the drive-through portico of PabExpo, the big hall hosting the closing gala dinner for the Festival del Habano. Male guests in tuxedos and formal guayaberas and women in dresses, gowns and kimonos walked the red carpet into the reception area where statuesque models handed out roses and goodie bags filled with Partagás cigars. Inside the giant, 400-yard-long hall was a sea of Cuban cigar industry luminaries, cigar retailers and fans of Cuban cigars. Fernando Domínguez, the premium cigar director of Imperial Brands was there, as was Alison Cooper, the CEO of Imperial Brands from the United Kingdom. At one table was Hirochi Robaina, one of Cuba’s top tobacco growers, and at another, José María Cases, Andorra’s cigar king. In the background, the Cuban National Radio and Television Orchestra played jazzy standards as the crowd of more than 1,200 found their way to seats at the maze of tables placed around the circular stage, flanked by floor-to-ceiling posters of the Partagás brand. The gala culminated a week like no other in the world of cigars, the annual Festival del Habano. The 2018 edition concluded on March 2, and it marked the event’s 20th anniversary. More than 2,000 people registered (there were 200 journalists alone), and they came from all corners of the cigar universe: cigar company executives, Habanos distributors, cigar shop owners and hundreds of consumers, many of them guests of the big cigar distributors. Cigars remain the festival’s biggest attraction, and this year didn’t disappoint. The headliner was a Cohiba Robusto Reserva Cosecha 2014, a 5-inch-by-50-ring limited edition. Another special release, the Romeo y Julieta Grand Churchill (7 1/2 by 56) will come in humidors made by Elie Bleu, and only 450 will be made. The 2018 Edición Limitadas were announced, and they will be the Romeo y Julieta Tacos (6 2/3 by 49), Bolivar Soberano (5 1/2 by 54) and the H. Upmann Propios (4 3/4 by 46). The 2018 Casa del Habano exclusives are a Hoyo de Monterrey Escogidos (7 by 49) and the San Cristobal de la Habana Prado, a petit pyramid at 5 by 50. The week is about more than just cigars. The opening night at the El Laguito protocol hall, a large indoor/outdoor space with gardens and a pool, saw people milling around the grounds, puffing away on the new Cohiba. Under the stars, there were Havana Club stands serving Mojitos, and roast pork dished out by the plateful. Los Van Van, Cuba’s best-known live-music band, hit the stage late in the evening. Tuesday was devoted to a field trip to the tobacco fields in San Juan y Martínez and San Luís. Havana’s cigar factories served as the focal point of Thursday’s activities. After an entire day of seminars at the convention center on everything from the genetics of Cuba’s tobacco hybrids to the history of the Festival, the Wednesday-night gala at the small 19th- century Teatro Marti in Old Havana was devoted to a celebration of Cuban dance and music. After, the guests headed to the fully renovated Opera House, a stunning building ablaze with lights, where they received a selection of Cuba’s top export brands. The final day saw the Habanos Sommelier and the Habanos World Challenge competitions. Darius Namdar of Mark’s Club in London defeated sommeliers from Cuba, Italy and Russia to capture the Sommelier award. The World Challenge, a new event, pitted regular cigar lovers against each other in two-person teams. Raffi Der Garapetian and Alexis Tsielepis from Cyprus held off a Cuban team through several rounds of questions testing cigar knowledge. The closing-night gala epitomizes what’s best about the festival: cigars and culture. The evening included a cavalcade of dancers and musicians in a three-hour performance, culminating with a live number by the Cuban band Orishas. When Heathcott’s gavel fell for the last time, the seven humidors had raised $1.8 million. The highest bid of $418,000 went for the Cohiba humidor, which came with 550 Cohiba cigars; the winning bidder was Hamed Abouzahr, a Lebanese Peruvian who distributes Habanos cigars in Peru, Bolivia and Ecuador. “We are human,” Abouzahr told Cigar Aficionado. “We did this for the public health of Cuba.” The biggest buyer of the night was Hamad Al-Shamsi of Dubai, who purchased three of the six humidors for a total outlay of $750,000. Other buyers included Bedar Zeidan of Phoenicia Trading, consumer Alex Wong from Hong Kong and Reza Valibalouch, a Belgian cigar merchant. A look at what has changed—and what has not—in Havana since 1992.